Our V1.1 Update is ready for you. Click the above link to get started, WATCH THE VIDEO, we are updating LOGS ONLY for the first ~24 hours, then Lives will be allowed to be updated. Thanks. …After our team reviews the submissions (after a few days) we will start listing the auction houses on our site. IMPORTANT: Do not submit more than ONE time per auction house. You are only allowed to submit ONCE. If you need to make changes to existing auction house times, SUBMIT A TICKET. ALSO, you are only allowed to post ONE auction time per day. You can have as many auctions you want per day, but only ONE of them can be listed per day on our site. This means you get 7 total possible listings on our site per auction house. Do not try to exploit this or go around it, else you risk losing your listing. 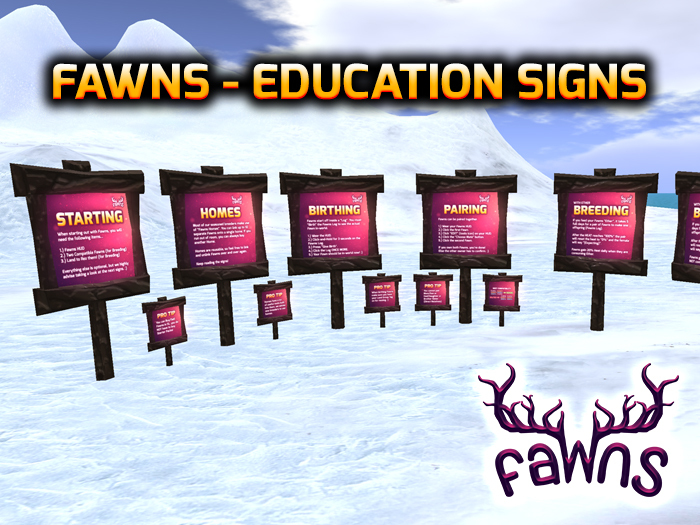 You can grab the Fawns Education Signs from the SL Marketplace for free. The Launch Affiliate Vendors are 5% Payout, enough to give a little something extra to people helping refer others to play with Fawns. Available on the Fawns Sim and The SL Marketplace (above). If you buy from Marketplace, make sure to scroll to the bottom and press the orange button to continue the purchase. The 3 Days Early Access for Fawns has just started for Pre-Order Customers! We just gave away 55x 4-Fawns Pre-Order Packs to testers who found some of the top bugs in beta. Not everyone who submitted bugs is getting a pack, as many bugs reported were duplicates, but we did our best to ensure anyone submitting something unique first received a pack. Congrats to everyone and thanks for helping! If you see your name on this list, the pack has already been added to your account and you can pick it up during pre-launch pickups. We are done with beta testing. We just finished Fawns Beta 3 and are actively preparing for the launch. First we will have the Pre-Launch, and 3 days after that we will have the “Launch”. We are giving our pre-order customers a 3-Day Head Start. After the 3 days are over, we will put out vendors for the Fawns Packs (not the same as the pre-order packs, those came with bonus LEs and are long gone), along-side the other vendors we had out already. 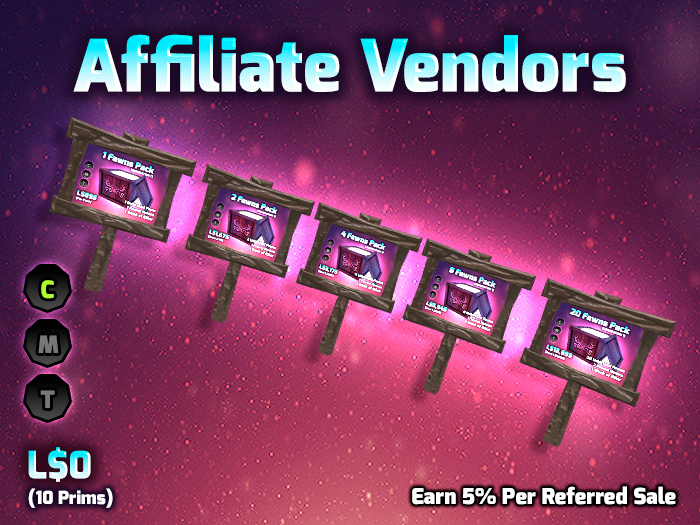 We will most likely have an Affiliate Program, but this will not be announced until after the pre-launch is over and the real launch has occurred – as we don’t want people buying Fawns Packs during the 3-Day Head Start. Thanks for hanging in there, we’re almost released. We will NOT be running this beta for “At least 5 full days”, in fact we will most likely only be running this for about one full day. You do NOT have to participate in this beta, but the more the merrier before the release of fawns. We’ve got some good news for Breeders and anyone currently or planning on running a Breedable Market. If you have not heard already, Second Life is increasing the prim limitations on Mainland Sims, Private Islands, Homesteads and Openspaces – starting as early as November 3rd for Mainland, and over the coming months they plan to start rolling out to Private Islands / Homesteads / Openspaces. It may appear that private regions are not getting anywhere near the amount of love as mainland plots, but hold on – they also announced some interesting news in their video stating that for an additional $30/mo (plus one time $30 fee) you can take your private island from 20k up to 30k prims! Don’t quote me on it, go watch the video yourself in case I misheard, but this is great news for breedable markets. Fawns Beta 2 & More! Yep, Fawns Beta 2 is starting now. You can go collect your pack by clicking here. These won’t be ready until the Official Fawns Launch, but we have 3 new Fawns Homes! The “Rock Nest”, the “Heart Rock Home” and the “Mushrooms Home”. We of course will still have the traditional Fawns Stump Homes available as well, but we wanted to spice things up a bit with a broader selection. Over time we will trickle in new homes as well. That’s about it for now. Enjoy the Beta Phase 2 Testing Experience, hopefully there won’t be too many bugs found so we can rush towards release. We’re ready to get these fawns up off of the ground!